Windows 8 has a lot to answer for, doesn't it? Forget Microsoft's drive towards hypnotic coloured squares and u-turn design policies; it's the insistence on touch that's made the most impact on the market. Just about every PC manufacturer worth its salt is saturating the market with wacky touchscreen designs and form factors that we potentially don't need. The Lenovo IdeaCentre B540p doesn't slide into the same odd niches as, say, the Asus Taichi or Dell's twisty screened XPS 12 - which will end up as artefacts when people later come to analyse the crazy decisions made in this decade - but it is kin nonetheless. It's a stab at something new, a bucket of features poured into a PC mould. It might seem to have been cast from the iMac imprint, but it's far removed. The Lenovo IdeaCentre B540p is a huge all-in-one PC, and when we say huge, we mean we had to roll our chair far from our desk in order to work on its enormous 23-inch screen comfortably. Of course it has a touchscreen, that most vital of components; in a desk context, this is absolutely unnecessary and ungainly, though it wouldn't be undue to suggest that the desk isn't the Lenovo B540p's most native environment. It wants to live on a dresser, on a kitchen counter, on a stand in your living room. It's a touch-enabled TV wrapped in a PC shell, with coax aerial and HDMI inputs for all your entertainment needs. Equally, the Lenovo IdeaCentre B540p is a capable PC performer, with a reasonable Intel Core i5 processor in the version we reviewed (though there's a Core i7 model available too), a huge cache of RAM, a decent Nvidia GeForce graphics card and a passive 3D panel. Pinning it down to one function feels utterly impossible. Forget the Dell Inspiron One or the HP Pavilion TouchSmart line, if any machine deserves the 'all-in-one' title, it's this. The big question is whether 2013's scad of innovations has built up to the peak of PC versatility, or a muddled, pointless mess priced at £1,350 / US$1,200 (around AU$2,210). Let's look at exactly what's inside this black slab of technology. Let's start from the outside and work our way in. The whole front of the Lenovo IdeaCentre B540p is a slick pane of glass, meaning the multi-touch screen is completely edge-free. We'll forgive it its hefty bezel, because it's quite an attractive machine, and the bottom edge conceals touch-sensitive buttons for volume, brightness and screen configuration. The unit is propped up by an adjustable stand that clicks between two primary positions, and you can angle the screen between these by putting a disconcerting but effective amount of additional stress on the rear leg. The sides harbour the extras you might expect. There's an optical drive, Blu Ray on most models (and we wouldn't recommend plumping for the DVD-only version, because scrimping when you're paying this much for a PC is lunacy), along with a couple of USB ports, a multi-card reader, and audio in and out. At the back you'll find four more USB ports, HDMI in and out, and a coax socket for the built-in digital TV tuner. It's software only, sadly, so you'll need to be booted into Windows 8 to watch anything. So, to the inside. Lenovo hasn't skimped. The screen is luscious and bright, a 23-inch 1080p panel with passive 3D capabilities, although its polarised viewing angle is rather shallow so you'll need to pick the perfect spot in the room to watch it from. The webcam sensor is 720p and surprisingly ungrainy compared to many, even in low light. A pair of Dolby-enhanced speakers blast sound from the base of the unit, and while Windows' internal volume isn't linked to the core volume control of the unit, they produce a satisfying sound, which is something that can't be said for most all-in-one desktop PCs, or even many dedicated TVs. There's more in the box besides. There's a couple of pairs of polarised 3D goggles - yes, they'll make you look stupid, but they fit over conventional glasses so we'll give them a pass. Plus there's a remote control - it's horrible, of course, but it at least has proper buttons so it's nowhere near as horrible as some - and a wireless mouse and keyboard combo. Lenovo really likes its keyboard. We don't. Sure, it's slim and perfect for use on a lap. And it doesn't feel cheap, as such. But typing is quite unpleasant, and the placement of the arrow keys means that right-shift aficionados will have a hard time. The mouse, conversely, does feel cheap, small, and although we didn't break it completely, we were tempted to crush it underfoot. Windows 8 comes pre-installed, and there's a cache of bloatware to keep Lenovo's sponsors happy. The important bits - PowerDVD 10 for discs, AVerMedia TV Player for keeping up with your favourite shows, CyberLink YouCam for taking silly pictures of yourself - are fine. The rest is easily ignored. Guts-wise, our review unit sported a quad-core Ivy Bridge Intel Core i5 processor, which is no slouch in processing terms, and a previous-generation Nvidia GeForce 650M graphics card with 2GB RAM onboard. The benchmark results show that Lenovo's spread of focus means the IdeaCentre B540p falls behind most desktop computers in technical terms. It's not nearly as zippy as a comparably priced gaming laptop such as the Samsung Series 7 Gamer, and it pales in comparison to proper desktop constructions under the 3DMark benchmark. But while its combination of components might not have the same grunt as a desktop processing set, we found them to be perfectly adequate in the context, and more than enough to at least run every game we tested. The 12GB of RAM in the PC probably didn't hurt matters, either. It's not really fair to focus too much attention on graphical performance, though. This is primarily an entertainment device, and it does its job well. The speakers boom, the 3D screen displays 3D perfectly well if you're the kind of masochist that enjoys that sort of thing, and Windows 8 boots quickly enough that the lack of a dedicated TV tuner component doesn't feel like that big a deal. If you don't power it down completely, the Lenovo IdeaCentre B540p's startup from standby is as close to instant as you'll possibly get - certainly aeons faster than most living room TVs. The fact that you can switch the PC on and off with the included remote is just, as they say in the rap game, gravy. The touchscreen is responsive and slick - though, as we've said, it's a recipe for gorilla shoulder and ruined eyes if you want to use it in desktop form. In fairness that's not a direct fault with the Lenovo B540p itself, more an issue with its context. Stand up to poke it then sit back down and it's just about perfect. This is a PC that might struggle to find a niche in your life, though. Are you looking for a TV? You can go and buy a much more capable 50-inch TV, with smart features and internet connectivity and a 3D screen, for much less money. Are you looking for a powerful PC? You can find one for half the price and wire it up to a comparable TV. Is a touchscreen so important that you absolutely must invest in a heavy 23-inch one that's tethered to a wall socket? Good luck to you. But if regular portability isn't important and you want a PC that does just about everything to a decent level, this might, just might, be for you. The Lenovo IdeaCentre B540p could well be Lenovo's flagship home desktop PC. It's less stuffy than its ThinkPad business laptops, less gimmicky than its flip-over Yoga laptop-tablet hybrids, and vastly superior to its previous line of all-in-one machines. It's absolutely crammed with features, and although it's pitched at a high price point it seems to deserve its billing. Lenovo's IdeaCentre B540p isn't as big as the TV you might have in your living room, but its range of media features make it the perfect TV for a bedroom or kitchen. It's got HDMI-in, a digital tuner of its own, an integrated Blu-ray drive, hefty rich speakers and a 1080p touchscreen 3D-capable panel, which means it can cater for just about every media whim. But it's not just a TV. The competent selection of components within mean it'll play just about any game with reasonable settings, and its wireless peripherals combined with that massive 23-inch panel mean you'll be able to perform most tasks from a distance. You'll have to, to be fair, because sitting close to a panel that bright is not the most pleasant experience. We normally baulk at do-it-all PCs. They're usually jacks of all trades, master of none. We wouldn't pin the 'master' badge on the Lenovo B540p, but we'd highly commend it in just about every aspect of its form. Plus, it's rather nice to look at - something most all-in-one computers seem to forget about. Conversely, there are some imperfect things about the Lenovo B540p. The remote control is full of tiny buttons unsuitable for the massive thumbs of overweight tech journalists. The keyboard is unpleasant to type on, the mouse a flimsy plastic shell that feels cheap and begs for instant replacement. There are plenty of better ways to spend your money, too, if this isn't the exact bit of hardware you're looking for. As a TV it's small, as a PC it's not all-powerful, and the 3D features suffer from a rather restrictive viewing range. 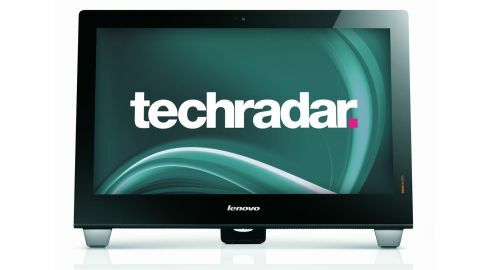 If you're absolutely sure you want a PC/TV combo, and you've got the money in your pocket, we can see no reason to buy any all-in-one other than the Lenovo IdeaCentre B540p. It's just about the pinnacle of the genre, and we reckon the impetus is now on Lenovo's competitors to catch up. If our ethical compass weren't so finely attuned, we'd hang on to our review model forever. But we probably wouldn't shell out the cash, because we're cheap.